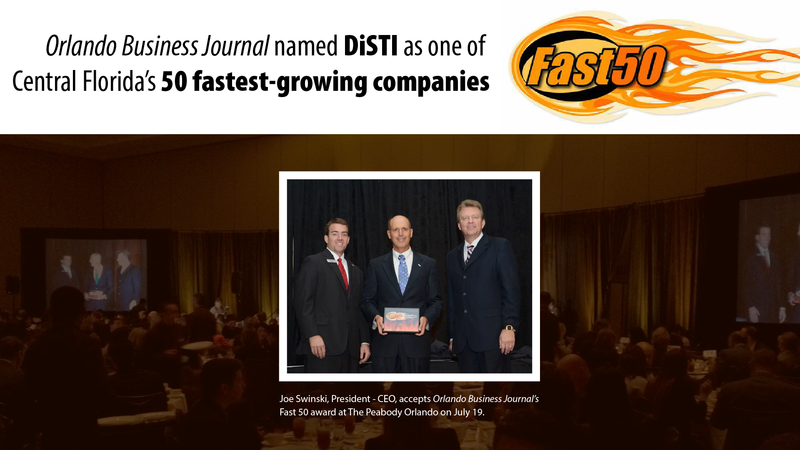 Orlando Business Journal recognizes DiSTI as one of Central Florida’s fastest growing privately-owned companies. The DiSTI Corporation, a leading provider of highly advanced graphical user interface software, has been recognized as one of the Fastest Growing Companies in Orlando, FL by the Orlando Business Journal. This award solidifies DiSTI’s position as a leader in the economic development of the Central Florida community, as well as an innovator in User Interface Design for numerous industries including automotive, medical, modeling and simulation, and defense. In its inaugural year, the Orlando Business Journal’s Fast 50 list comprises Central Florida’s 50 fastest-growing privately owned companies and was based on revenue by percentage growth from 2010 to 2012. The award banquet and networking event was held at the The Peabody Orlando resort on Friday, July 19th. To read the full article by the Orlando Business Journal, visit http://www.bizjournals.com/orlando/news/2013/06/26/the-fast-50-obj-unveils-the-inaugural.html. DiSTI is a global leader in the development of User Interface software for businesses, governments and the military. The company’s flagship product, GL Studio, enables programmers and developers to build high-fidelity graphics, 3D simulations and fully interactive controls into their models, enhancing the level of realism and sophistication, while improving learning and retention.